Are Yorkies Good With Cats? Portable and cute, Yorkshire terriers make great pets that, if properly socialized, do well with cats. 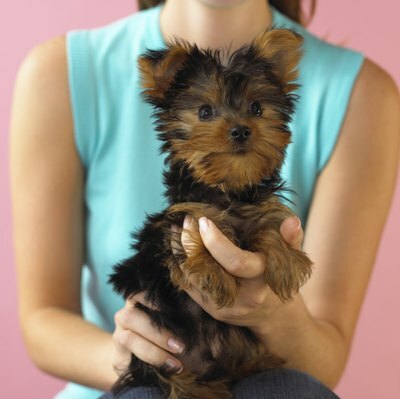 Cute and tenacious, Yorkies can make loyal, loving pets or pouting princesses. It's tempting to think they'll fair well with cats given their similarity in size, but that's not always the case. It's up to you to socialize both animals. If all goes well, you may even foster YouTube-sensation-fodder cuddling. If you're on the hunt for a toy dog packed with personality, look no further than the Yorkshire terrier. Yorkies -- as they're called by fanciers and aficionados -- are prized for their bravado and determination, as well as their investigative, energetic nature, according to the American Kennel Club. These English exports are either oblivious to their tiny stature or have the canine equivalent to the Napoleon complex. If properly socialized, Yorkies do well with cats. If you spoil them -- for instance, allowing them to jump on you in a manner unacceptable for larger dogs -- their untethered egos can become a problem. This is half-jokingly called Small Dog Syndrome, and it's the bane of cat-kind's existence. The maxim is trite but true: Past behavior is best indicator of future behavior. If you're adopting a Yorkie, learn as much as you can about his past experience. Did he live in a home with children? Other dogs? Cats? Ask the shelter or breeder staff if you can take your prospective companion animal to areas with cats. It's probably a higher stress situation than he'll face at home, but it offers a glimpse of his general disposition. If you've already got a Yorkie at home, look at his current behavior. If he looks like a candidate for a segment on Cesar Millan's "Dog Whisperer" show, you've got some training to do before you introduce a cat into the mix. The results of a Tel Aviv University study reported in 2008 include the recipe for lifelong harmony between cats and dogs: get the cat first, preferably less than 6 months old, then introduce the dog, preferably less than a year old. If this isn't an option, you can still foster peace between your Yorkie and your cat. Introductions are key, especially from the feline perspective. Use baby gates to confine the dog to one or two rooms that the cat's already familiar with and put him on a leash. This allows the cat to approach the dog on his own terms, tempered by the knowledge of escape routes and high-ground vantage points. If you're bringing a cat into a home with a Yorkie, confine the cat first, then reverse the quarantine. Limit the duration of early play dates between your Yorkie and your cat. Build on past successes, and always try to end on a positive note. Expand the space and time of these visits before unleashing both animals in the house at large. Affection, treats and toys are great positive reinforcement tools. Clicker training is another good approach. You can try feeding both animals in close proximity, but dogs often try to steal protein-rich, fatty cat food. If your Yorkie barks, bites or lunges at the cat, a firm "no" or "sit" is in order. Disciplining the cat is not a good idea, as negative associations are harder to break, so make sure to trim the cat's claws regularly to avoid a nasty -- but sometimes informative -- scratch on your dog. The goal is love, but settle for peaceful respect. Petfinder: My Dog Chases my Cat -- How do I Stop Him? VetStreet: How Do I Stop my Dogs From Chasing my Cat? What Kind of Cat Likes Dogs? Why Do Dogs Like Socks?